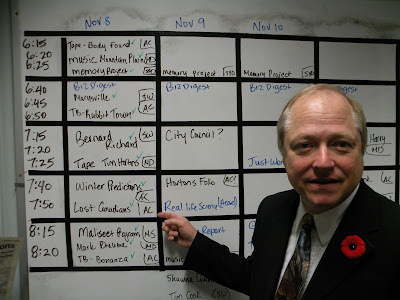 Don Chapman points to Lost Canadians interview time slot at CBC Information Morning Fredericton, Monday, November 8, 2010, Fredericton, NB. Today, December 29, 2010, on David Gibbons, In Discussion on Voice America, listen to a new, original broadcast of "The Lost Canadians - Fighting for Canadian Home Soil" with Don Chapman Founder Lost Canadians, Sheila Walshe, Jim Doe (Alias), Glenn Fenech, Schneur Rabin & Jackie Scott. Click on the link below to go directly to David Gibbons "In Discussion" on Voice America.